Ok, so this really isn’t a recipe as much as it is a public service announcement for an often overlooked squash…the delicata. Although it’s considered a winter squash, it’s actually in the same species as all other summer squashes. After a recommendation from the cashier at Trader Joe’s, I grabbed one of these lovely little delicate squashes and brought it home to add in as a quick side dish for dinner that night. I just did a simple roast on it with nothing more than a light misting of olive oil and sea salt, but wow was it good! And SO much easier to work with than butternut squash. I left the skin on when cooking, and then just peeled it very easily right off of the skin as I ate it. It was tender, mildly sweet and absolutely delicious. Next time, I want to try it with topping I used on these Spicy Acorn Squash Wedges. 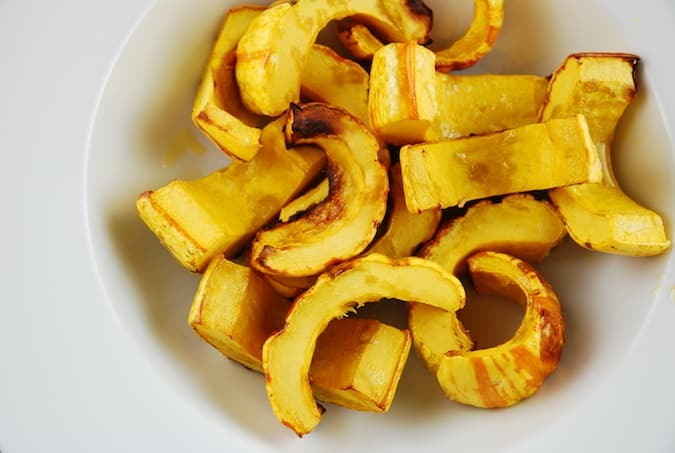 This Roasted Delicata Squash Recipe is simple, delicious and full of nutrients. So the next time you want to try some squash, don’t overlook the delicata! Simple and nutritious, the delightful delicata squash gets featured in this easy and healthy recipe. The caramelization that occurs during the roasting process adds a wonderful and complex flavor to a beautiful and uncomplicated squash. Preheat oven to 425 degrees. Line a small baking sheet with aluminum foil or parchment paper and mist with cooking spray. Cut the squash by first cutting it in half lengthwise. With a spoon scoop out the seeds and discard (or you can roast them like pumpkin seeds if you’d like!). Now slice each half into 1/2 once segments. Place onto baking sheet and mist lightly with an olive oil mister, making sure to cover all sides of the squash flesh. Season with salt. Place in oven and roast for about 20-30 minutes, turning occasionally, until squash is tender and has begun to brown. Season with additional salt as desired. Yes, eat the peel -so much easier and you can microwave it too ! You must’ve read my mind – I’m newly obsessed with delicata squash! So pretty! Edible skin! Also the seeds roast up really really fast and are delicious too with a sprinkle of sea salt! Yes, just wanted to say the same as Beth. That skin is totally edible. You don’t even have to peel as the skin is delicious, too! I could eat this squash every single day!